From the creators of Olivier Award winning “Showstopper! The Improvised Musical”, this is competitive improv as you’ve never seen it. 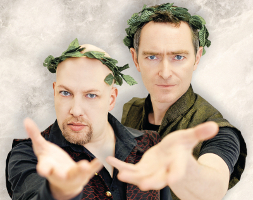 Honouring ancient Athenian traditions, two rhapsodes, Adam Meggido and Sean McCann, compete to improvise a fully authentic Shakespearean masterpiece on the spot. Featuring rap, poetry slams and any writer from the last 3,000 years, from Homer to Pinter, from Poe to Dr Seuss. A unique celebration of the poetic, the dramatic and the absurdly comic, ‚The Shakespeare Smackdown! will change the way you think about improv and, quite possibly – Shakespeare.